Both the Romans and the Greeks were attracted to the dramatically beautiful coasts and fertile plains of the region later known as "The Kingdom of the Two Sicilies." In fact, all myriad influences that shaped modern civilization in the Mediterranean come together in Southern Italy and Sicily. The world's first secular university was founded in Naples. Many of the elements of Italian culture as we now know it in the rest of the world―from comic opera to pizza―were born in the South. Art and music flourished there, as did progressive ideas about education, tolerance, and civic administration. Native Neopolitan and distinguished scholar Tommaso Astarita gives us a history both erudite and full of personality―from the freethinking, cosmopolitan King Frederick who conferred with Jewish and Muslim philosophers (and dared to meet with the Sultan) to the fisherman Masaniello who inspired artists and revolutionaries across Europe. In the medieval South, Jews, Muslims, and Greek and Latin Christians could practice their religions, speak their languages, and live in mostly peaceful cohabitation. From the sixteenth to the eighteenth century, Naples was on par with Paris, one of the largest and most cultured cities in Europe. During the Enlightenment, southern Italy captured the European imagination, and many people traveled far and wide to enjoy southern Italy's ancient ruins, beautiful landscapes, sweet music, and magnificent art, marveling at the lively temperament of the southern population. The drama and beauty of the region inspired visitors to claim that one had to "see Naples, and then die." Yet negative images of the Italian South's poverty, violence, superstition and nearness to Africa long fueled stereotypes of what was and was not acceptably "European." Goethe noted that he had gladly studied in Rome, but in Naples he wanted "only to live," for "Naples is a Paradise: everyone lives in a state of intoxicated self-forgetfulness, myself included. 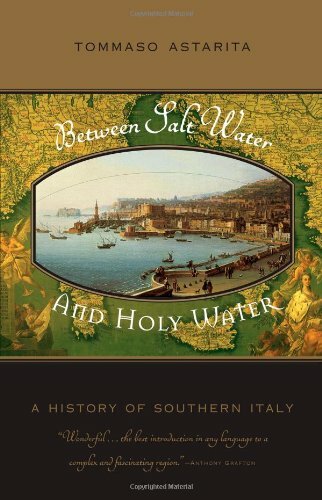 From the Normans and Angevins through Spanish and Bourbon rule to the unification of Italy in 1860 and the subsequent emigration of vast numbers of Southern Italians, Between Salt Water and Holy Water captures the rich, dynamic past of a vibrant land.